No matter what side of the aisle you sit politically, a government shut-down could cause more havoc to our zoo animals than the political animals that caused this ruckus in the first place. With annual funding for the U.S. government expiring on September 30th, it's up to Congress to pass a bill to keep our government afloat, and the gates to our zoo open. The National Zoo is aligned with the world’s largest museum complex - the Smithsonian Institution -- which is funded by the government. Entry is free - but the Smithsonian relies heavily on concessions for its auxiliary revenues, and with a government shut-down, SI and its zoo will be shuttered to the public. In that case, only essential government employees would report to work. And many popular tourist spots like the National Zoo would close. 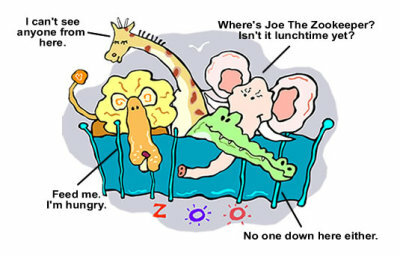 Voice of America's Carolyn Presutti shows us what kind of a zoo, Washington would look like during a shutdown and sequestration. Well how does that affect the average citizen that might not be visiting the Smithsonian National Zoo any time soon? Well, Buttermilk IIfor starters, the "Baby Panda Cam" might also be on the chopping block. And if you're addicted to a daily dose of watching. Bao Bao's progress at the zoo (born on August 23), you'll be out of luck. You may have to find an alternate source for your 'cuteness' fix, since that specific remote cam-operation is run by volunteers. As testimony to how popular our nation's baby panda is, this YouTube vid was only posted a few days ago (before I filed this post) and has already tallied 17K+ views. When question Linda St. Thomased as to the welfare of Bao Bao, Linda St. Thomas, chief spokeswoman for the Smithsonian Institution said: “We would never, ever leave the animals unattended.” Quizzed whether the new arrival would continue to receive his 'three squares a day,' St. Thomas laughed. “I think her mother is taking care of that, actually.” She was referring to the cub still being fed by her mom, Mei Xiang. It's a bit disconcerting, that while we were allowed to track Mei Xiang's months of pregnancy, her labor and the first few weeks of her baby cub's life, that the government has made no allowances for our national treasures to be available to public viewing during a potential shut-down. And while our politicians might say: "they have bigger fish to fry," to watch our lawmakers reduced to acting like children, while our own children are deprived free access to our national institutions is shameful. This is no way to run a business -- let alone a government of one of the most distinguished nations of the free world. measure by a 12:01 a.m. ET deadline. Government officials told agencies to begin executing plans for a shutdown -- the first in 17 years! Here's hoping all the zoo animals will be protected and well take-care of by the essential personnel still on duty. Dinosaurs Exist Today! The Animal Video Of The Day!! !